New Mexico School for the Deaf provides educational and support services to deaf and hard-of-hearing children from birth to age 22. The school has a current enrollment of 108 students on the main campus, with an additional 178 students in Early Childhood Programs. Funding for this project was set aside from capital outlay for Hester Hall. The Local Selection Committee sought a timeless, highly visual original artwork that communicates what it means to be a member of the deaf community while also expressing a childlike spirit. Maureen Melville from McLean, VA was selected for the project. The artwork was installed in March 2009. With significant community involvment, Melville designed and fabricated three large site-specific stained glass windows which were installed along the main corridor of Hester Hall. The colorful panels depict children, native plants and animals, and an abstract composition of eyes and hands. Melville received her BA in Art History from the University of Chicago and a Master of Architecture from the Graduate School of Design at Harvard University. Her career in public art spans more than two decades. 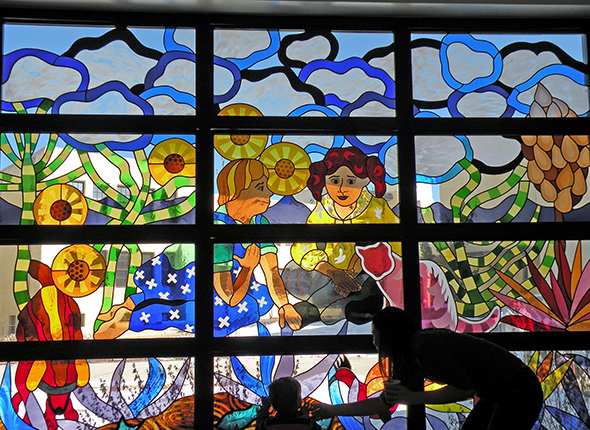 She has won numerous commissions for stained glass windows and fused glass murals throughout the United States.